Changes to Boca Grande parking may be coming soon, as Lee County Commissioners will be addressing potential revisions in our parking ordinance on Tuesday, April 16 at their regular monthly meeting. 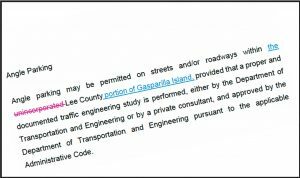 Known as the “Boca Grande/Gasparilla Island Parking Ordinance,” this document was created in December of 1991. The Boca Grande Parking Committee is comprised of private residents and business owners from within our community with diverse thoughts and opinions on island parking.